Here’s what you need to know about Jackie Kennedy's iconic pink skirt suit that captured both the heady glamour and visceral violence of that fatal day in Dallas, Texas. 2. 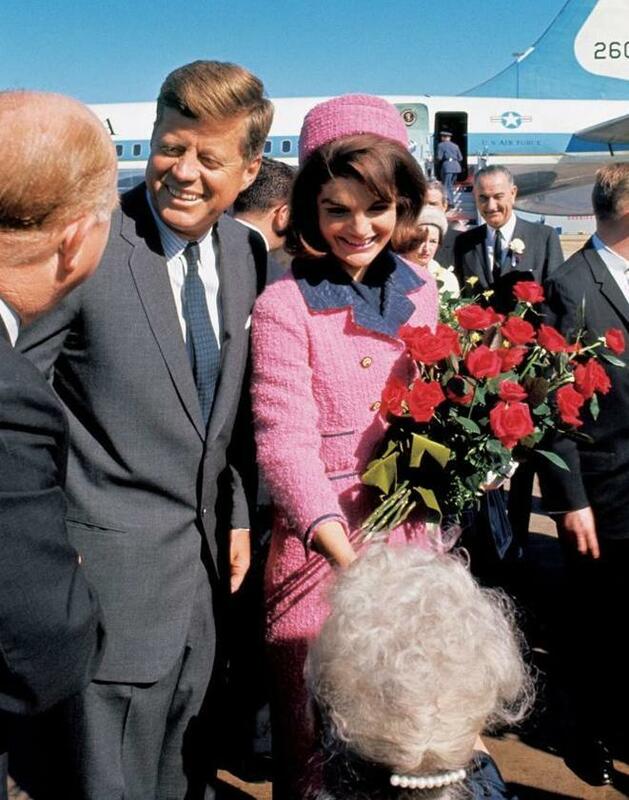 At the time, the majority of the public didn’t know the suit was pink: In 1963, newspapers didn’t print colour photos and television news wasn’t broadcast in colour – it wasn’t until 11 months later that Life Magazine would publish full-page colour photos of the Kennedy’s arriving at Love Field – these were taken from an director Abraham Zapruder's film. 3. Jackie didn’t remove the blood-stained suit until 5am the morning after the assassination – her personal maid Providencia Paredes placed it in a box along with her stockings, shoes and bag. 4. The whereabouts of the pink pillbox hat remains a mystery – Jackie’s personal secretary, Mary Gallagher recalls: “While standing there (at Parkland Hospital in Dallas) I was handed Jackie’s pillbox hat and couldn’t help noticing the strands of her hair beneath the hat pin. I could almost visualize her yanking it from her head.” What happened to the hat after that is unknown – Mary Gallagher lost track of it while at the hospital. 5. Some days after the assassination this box was dispatched to Kennedy's mother, Janet Lee Auchincloss, who stored it in her attic. Sometime before July 1964, the box was given to the National Archives in College Park, Maryland, together with an unsigned note bearing the Auchincloss letterhead stationery – the note read: "Jackie's suit and bag worn Nov. 22, 1963." This is stored alongside Oswald's rifle, bullets and bullet fragments from the shooting, the original windshield of the limousine, and more than five million pages of assassination-related records. 6. The suit, which was never cleaned, is kept out of public view in an acid-free container in a windowless room (the precise location is kept secret). The temperature hovers between 18 and 20 °C degrees; the humidity is 40 percent; the air is changed six times an hour. 7. To the best of anyone’s knowledge, access to the suit for research purposes has never been granted. 8. The Kennedy family never advised the archives about cleaning the suit, although leaving blood and other residue on garments is a standard conservation practice. “It’s part of the history of the object,” said Phyllis Magidson, curator of costume and textiles at the Museum of the City of New York. 9. The suit will not be seen by the public until at least 2103, according to a deed of Caroline Kennedy, Jackie's daughter and sole surviving heir. At that time, when the 100-yar deed expires, the Kennedy family descendants will renegotiate the matter. 10. In 2011, a copy of the suit appeared in the mini-series The Kennedys starring Katie Holmes – this Chanel copy was recreated by Giorgio Armani.